Stuff gets hot. that’s just a simple fact. And here’s another simple fact: heat kills electronics. That’s why the devices we own have big fans and big heat sinks. There’s another solution, though: improve airflow. One of the easiest ways to improve airflow is to let more of it flow underneath. Often times, manufacturers put vents on the undersides of their products so that random objects, dirt and dust can’t flow in. This is a compromise, obviously, because you’re keeping the inside of the equipment clean but you’re also making it harder for heat to escape. If any of your home electronics are hot to the touch then it’s time to increase the airflow around them. Routers are a prime candidate for this. For a flat-bottomed piece like a router, one of the best solutions is those rubber cups that you put on the bottom of chairs. They usually give a nice base of support if you put them out on the corners. If you have one of DIRECTV’s external SWM multiswitches, you know it’s probably the hottest part of your home theater system. 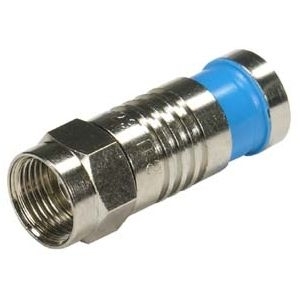 Many of our Solid Signal customers have reported that a simple part can really increase airflow around them and it’s probably something you already have: compression connectors. Take uncompressed compression connectors and use them to set the SWM away from the wall. You’ll need four of them, and four long screws to thread through them. The perfect solution would be wall anchors with a relatively slim machine screw that can fit through the hole in the compression connector and still has the strength to hold up a SWM that’s now offset a little more than an inch from the wall. Give it a try, but of course make sure that all equipment is disconnected and that you’re taking every possible precaution. If you do it right, you’ll find that your multiswitch will run a lot, lot cooler.